Statement: Success of economic policy in India has to be judged by its success on the poverty front. I. Success of the economic policy is determined by the level of poverty in the country. II. Economic policy for India should be formulated keeping in mind the state of poor people. The statement implies the level of poverty shows how much the economic policy has been successful. Hence, assumption I is implicit. According to the main statement, success on the poverty front is measure of the success of an economic policy. So, it is assumed that economic policy should be formulated considering the condition of poor people. It should work towards alleviating poverty. Therefore, both I and II are implicit. Statements: Regardless of circumstances, a crime is a crime and should always be treated so. I. A criminal should always be punished. II. Circumstances should not be given any weightage while deciding on the fate of the malefactor. The statement implies that irrespective of the situation in which a crime is committed, a crime should always be treated as a crime. It is not implicit in either of the assumptions. Statement: Should luxury hotels be banned in India? I. Yes. They are the places from where international criminals operate. II. No. Affluent foreign tourists will not have a place to stay. International criminals can operate from various other places also. So, banning luxury hotels is not the solution of this problem. Hence, argument I is weak. Comfort of foreign tourists is not a strong enough argument for banning the luxury hotels. Hence, neither I nor II argument is strong. Statement: Is common currency a necessary ingredient for Europe’s growth? I. Yes. A common currency will enable entire Europe to market itself as one. II. No. Similar experiments by Latin America countries have not affected their economies. Europe marketing itself as one will definitely contribute towards Europe’s growth cannot be ascertained. Also, if similar experiments were not successful in other countries then it does not mean that they will not work in Europe as well. So, none of the argument is strong. 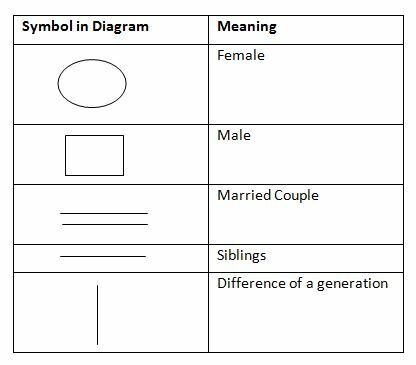 (Directions 5 – 6): Study the following information and answer the given questions. 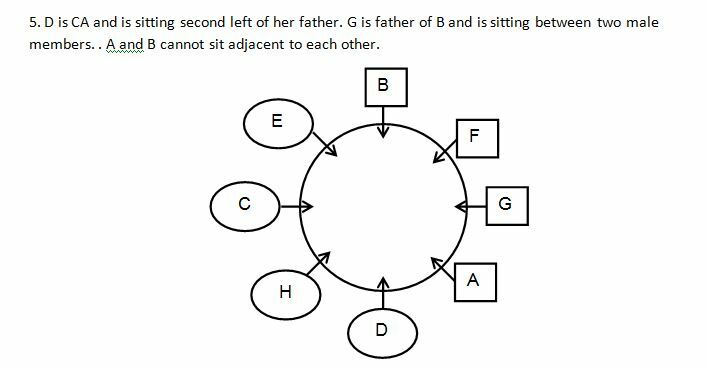 A, B, C, D, E, F, G and H are eight members in a family. Among them, four are males and four are females. There are three husbands, three wives, two daughters and two sons. They all have a different profession like – lecturer, professor, lawyer, businessman, beautician, doctor, housewife and CA. They all are sitting around a circular table facing at the centre. 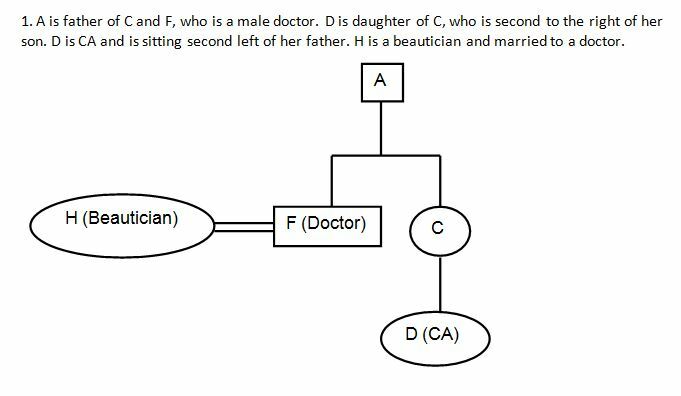 A is father of C and F, who is a male doctor. 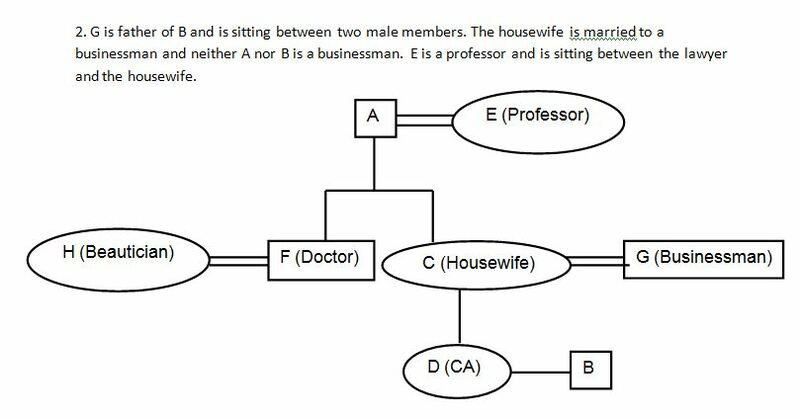 The housewife is married to a businessman and neither A nor B is a businessman. 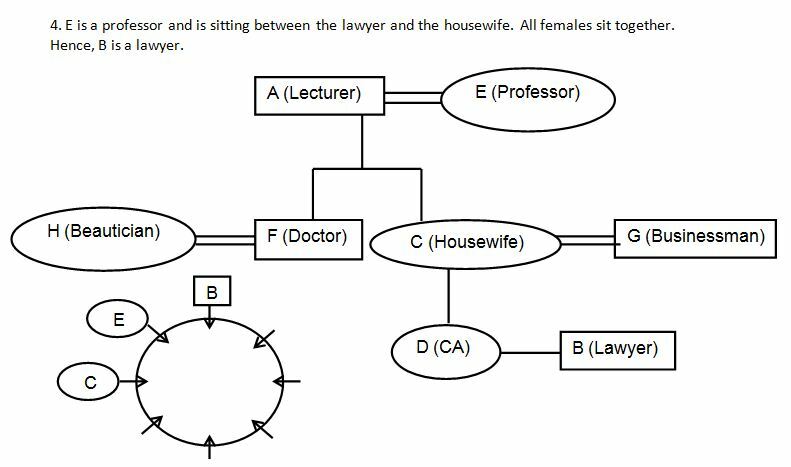 E is a professor and is sitting between the lawyer and the housewife. No male is a professor. G is father of B and is sitting between two male members. D is daughter of C, who is second to the right of her son. H is a beautician and married to a doctor. D is CA and is sitting second left of her father. A and B cannot sit adjacent to each other. All females sit together. 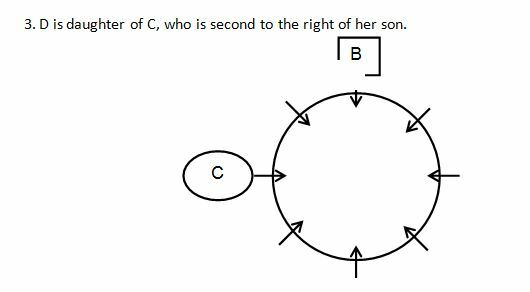 How is D related to B? Who among the following is a lecturer? (Directions 7 – 8): Study the information given and answer below question. Six lecturers viz. P, Q, R, S, T and U were taking lectures in the same week starting from Monday to Saturday, one on each day. 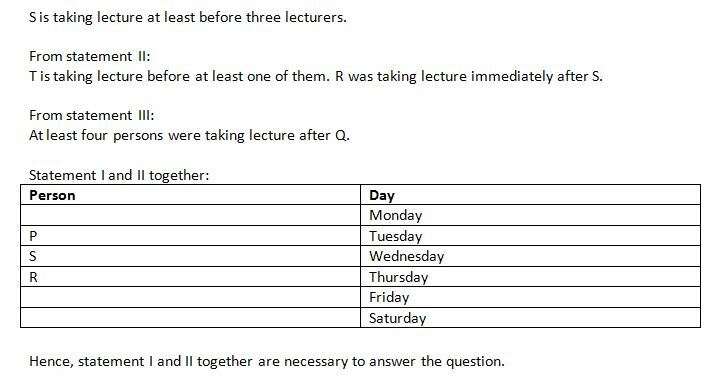 How many are taking lectures before R? I. S is taking lecture at least before three lecturers. P is taking lecture on Tuesday. II. T is taking lecture before at least one of them. R was taking lecture immediately after S.
III. At least four persons were taking lecture after Q. Among A, B, C, D and E are each having different weight, who is the heaviest? I. D weighs more than only two persons; E weighs more than A but less than B.
II. A weighs more than C but less than E. E is not heavier than B. If the data in statement I alone are sufficient to answer question. If the data in statement II alone are sufficient to answer question. If the data either in statement I alone or statement II alone are sufficient to answer question. If the data in both the statements I and II together are not sufficient to answer question. If the data in both the statements I and II together are sufficient to answer the question. Answer – 5) If the data in both the statements I and II together are sufficient to answer the question. In this statement, C’s weight is not mentioned at all. Clearly, statement I is not sufficient to answer the question. In this statement, D’s weight is not mentioned at all. Clearly, statement II is not sufficient to answer the question. Hence, data in both the statements I and II together are sufficient to answer the question. What will be the possible code of ‘university’ in that language? 1) First element is a letter which represents the last letter of the word. 2) A second element is a number which represents the number of letters in that word. 3) The third element is the letter which represents the next letter of second letter in the word. In the given code language, what does the code ‘P11D’ means?